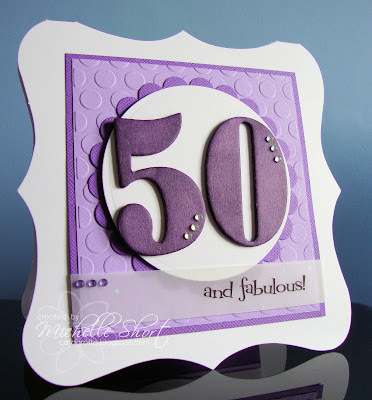 The Card Grotto: 50 and Fabulous! Here is a card I have made for my aunt. I have used Maya Road Philadelphia chipboard numbers and coloured them with a Copic marker and added Clear Bazzill Jewels to them; these have then been added to circle layers cut using Nestabilities dies - the white layer is 3d foamed from the scallop layer and added to base with DST. 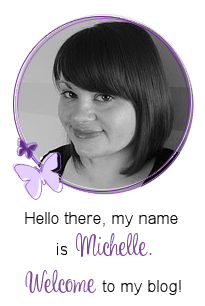 The base is a sheet of DB Fairy Dust CS which has been run through my Cuttlebug using the Seeing Spots embossing folder and layered with DB Lilac CS. The greeting has been printed (from my PC) on to sparkly vellum and wrapped around the layers with Wild Pansy Bazzill Jewels added. The whole lot has been added to a white CWC Elegant card blank. 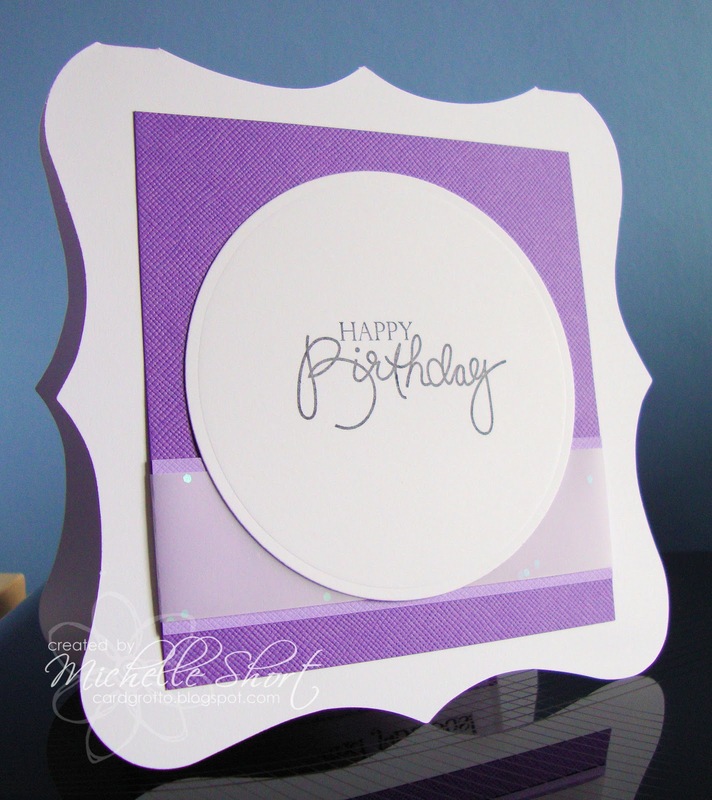 For the inside I have layered up more cardstock and vellum and stamped the PTI (Birthday Bash Sentiments) greeting onto a white Nestabilities circle. STAMPS: Papertrey Ink. INk: Memento Tuxedo Black. 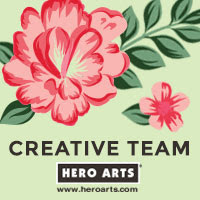 CS: Craftwork Cards, Doodlebug Designs, Paperchase Vellum. TOOLS: Nestabilities dies, Cuttlebug Seeing Spots Embossing Folder, V17 Copic Marker. EMBELLISHMENTS: Maya Road Chipboard Numbers, Bazzill Jewels. It seems that spring has really sprung now, what lovely weather we have had today so far. I hope everyone is having a nice day whatever you are up to! We've had lovely weather here in Scotland today! Makes a lovely change from the grey dreech miserable days we've been having of late!! Gorgeous card Michelle, big and bold!! Gorgeous card. I'm 50 at the end of this year along with a couple of friends so I hope you don't mind if I use your card as inspiration for their cards!